The second Championship game of the All-America Football Conference on December 14, 1947 featured the same two teams as the first, the Cleveland Browns and New York Yankees. The Browns had beaten New York in four of five meetings thus far in the AAFC’s two-year existence, which included the ’46 title game and the first regular season matchup in ’47 in Cleveland. They rallied to overcome a 28-0 deficit and salvage a tie a few weeks earlier in New York. The powerful Browns, coached by the innovative Paul Brown, had compiled a 12-1-1 record in topping the Western Division once again. 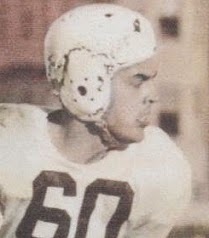 QB Otto Graham (pictured above) was named MVP by the league and was the AAFC’s top passer while end Mac Speedie, with 67 catches and 1146 yards, was the preeminent receiver and had an able counterpart in end Dante Lavelli. FB Marion Motley rushed for 889 yards with an impressive 6.1-yard average. The league’s highest-scoring team, Cleveland was equally tough on defense. New York, under the direction of Head Coach Ray Flaherty, operated a single-wing offense that featured tailback Spec Sanders, the AAFC’s leading rusher (1432 yards) and scorer (19 touchdowns, 114 points). Diminutive and fast HB Buddy Young added another 712 yards on the ground and the line was good on both sides of the ball. The Yankees put together an 11-2-1 record in topping the Eastern Division. There were 61,879 fans in attendance at Yankee Stadium on a cold day with the temperature near freezing. The turf was frozen, which seemed to affect the home team more than the visitors from Cleveland, and the teams agreed to wear cleats rather than sneakers. The Yankees had the first possession and quickly found that Cleveland had made defensive adjustments to prevent a repeat of New York’s 28-point first half performance in the previous meeting. Late in the first quarter, following an exchange of punts, the Browns put together a 67-yard drive that was highlighted by a 51-yard carry by Marion Motley and culminated in a touchdown on a quarterback sneak by Otto Graham, who had also completed five of his first six passes. Lou Groza kicked the extra point. The Yankees came right back as the game headed into the second quarter. Buddy Young (pictured at left) and Spec Sanders spearheaded an advance that reached the Cleveland five yard line before stalling, primarily as a result of the poor footing, and Harvey Johnson kicked a 12-yard field goal. Cleveland had two more chances to score, but Groza missed two field goals and the score remained 7-3 at halftime. In the third quarter, DHB Tom Colella intercepted a Sanders pass and returned it to the New York 41. Motley ran for 16 yards, tosses by Graham to HB Edgar “Special Delivery” Jones and HB Lewis Mayne picked up another 19 yards and, three plays later, Jones ran four yards for a TD. Lou Saban, who had booted 10 extra points during the regular season, successfully converted. As the game headed into the fourth quarter, the Yankees drove to the Cleveland 18, but Young fumbled a lateral and Saban recovered at the 31. Another New York series highlighted by a 22-yard carry by Sanders reached the 23 but was blunted by a penalty for unnecessary roughness that moved the Yankees out of range for a score. Cleveland held on to win by a final score of 14-3. The Browns had the edge in total yards (284 to 212) and first downs (15 to 13). The Yankees turned the ball over three times, to one suffered by Cleveland. The Browns gained 172 yards on the ground, with 109 generated by FB Marion Motley (pictured below) on 13 carries. Otto Graham completed 14 of 21 passes for 112 yards, giving up no interceptions, and also ran the ball four times for 21 yards and a touchdown. Mac Speedie had four pass receptions for 25 yards and Dante Lavelli gained 37 yards on his three catches. Suffering from a bad ankle, Spec Sanders was held to just 40 yards on 12 carries and failed to score a touchdown for the first time all season. He also completed 7 of 17 passes for 89 yards and was intercepted once. Buddy Young rushed for 69 yards on 16 attempts and caught two passes for a team-leading 25 yards, but fumbled twice. “I can’t overemphasize how much that slick footing cost us,” summed up Coach Flaherty for the Yankees. The Browns went on to an even better season in 1948, compiling a perfect 14-0 record and winning a third AAFC Championship. They met Buffalo, not the Yankees, for the title as New York dropped to 6-8 and a third place finish in the Eastern Division.